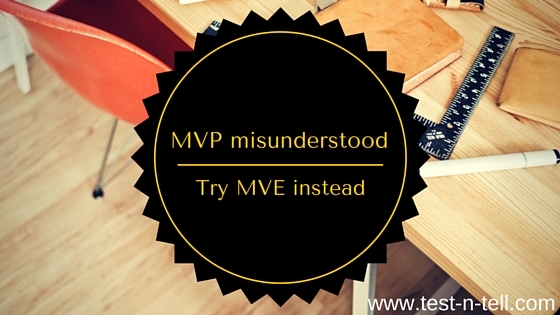 By now everybody should be familiar with the concept of an MVP? Are you? Good. Now remember the last time you did an MVP. What was your goal? What should have been your goal? Remember last time you've used MVP acronym? What was the context? Learning, obviously. Yes? Well, I hope so. Because last time I've heard MVP in a conversation was something along those lines: "... let's just release it as an MVP, see if anybody gonna use it and then take it from there". I was nodding in agreement and only an hour later it got to me: "Did we just called version 1 of the product an MVP?". What is a product? Something you can package and sell, right? So in the context of an MVP, "Product" makes us focus on features, presentation and value proposition. While we know, or should know, that we need to be focused on learning only. And that's crucial. To learn something about your product idea you don't need to build anything. So let's just change one word and see if that's gonna help the understanding. Steven Cohn, the founder of the "Validately", did just that and proposed MVE. What’s the MVE you ask? Well, it is a prototype or a concierge MVP or anything else that you can use to validate or invalidate a product hypothesis. Yeah, don't read too much into that. Change just one word. But this change might set significantly different expectations. It's not the product anymore, it does not need to look, does not need to work or to convert. It's an experiment. It needs to prove or disprove a hypothesis. And after you'll have all the learning from it - just throw it out the window. When "build" part is not an option for you. Product teams in large companies are not as nimble as startups due to increased layers of communication and decision making, and increased brand and legal risk, among other factors. For enterprise product managers, validated learning comes far more rapidly utilizing other strategies. Instead of a “Build-Measure-Learn” approach, enterprise product managers need to take an “Experiment-Measure-Learn” purview. Depends. If you sure you use an MVP in a correct, the Lean way, then I congratulate you, well done and long may it continue. But if you spend months building an MVP. When you ready to kill yourself or somebody else on your team you finally launch it. Then you see how it converts. You try to find proves it does convert! You find it and plan a second version. Well, in this case, you might want to try this small change in thinking. Death to the Minimum Viable Product!